Monday October 13 Quite frosty this morning, but passed off during A.M. Sun out enough to dry the clothes in P.M. in A.M. I was over to see Rose & little one, then down to Mrs Spaulding's & in to Mrs Howe's of errand. I did up morning work, Lena doing washing. After about 2 1/2 o,c, I went with Mrs H_ out shopping, then we called to see Rose & baby & in to see Maz Stewart awhile. 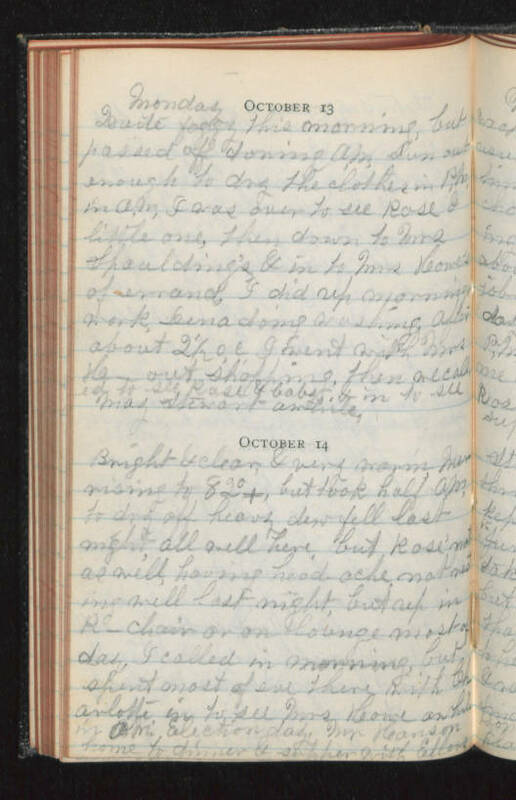 October 14 Bright & clear, & very warm Mer- rising to 82°+, but took half A.M. to dry off heavy dew fell last night, all well here, but Rose' not as well, having head-ache not resting well last night, but up in R-chair or on lounge most of day, I called in morning, but spent most of eve there with Charlotte in to see Mrs Howe awhile in A.M. Election day, Mr. Hanson home to dinner & supper with Ellery.